In 2004, I joined a large textile art group making monthly quilt art "pages" called Journal Quilts, sized 8 1/2" x 11". That was the third year the project had been going. Many found it helped them develop their work in various ways. 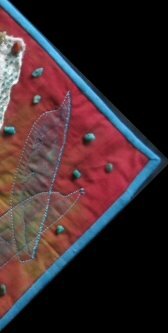 included in a new book called "Creative Quilting". 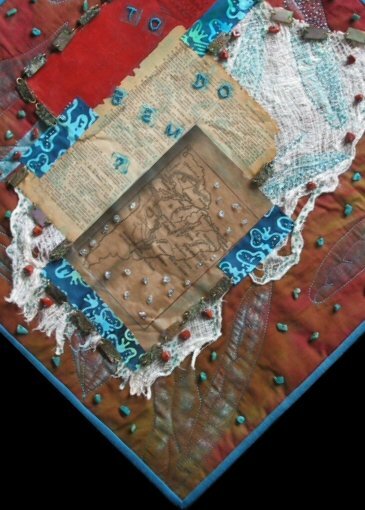 My first series of Journal Quilts were called "The Elizabeth Pages": A private textile journal of Elizabeth the First. These pages from 2004 are Not For Sale. An exploration of incorporating fashion samples into art. These journal quilt pages from 2005 are For Sale. Prices are listed on the individual page in British Pounds. If you use a different currency, you may wish to use the function on this site. "The Forgotten Tudors": A continuation of the Tudor theme. These pages from 2006 are Not For Sale. In 2007, the Journal Quilt project in its first stage came to an end. The quilts were different from the other years - ONE 17x22 piece. This piece incorporates at least three of the techniques found in the "Creative Quilting" book. In 2008, the Journal Quilt project was revived in a new form whereby an artist is to make 2 pieces of a similar size to that in 2007. However. to have the work displayed, it must be juried into the show. Thinking the journal quilt project had finished, I also joined one of the many groups who have recognised the potential for personal development in the project and have taken this concept on board. The Quilt guild of the British Isles started their own Journal Quilt project last year with the A4 format. This year the challenge is to work in a 12in. x12in. format. These will be shown at various venues in the UK in 2009. Here are the quilts I have made so far. I am exploring some ideas I had about colour and shape, using a thick wool blanket which has been chopped up and dyed with Kool-Aid. If For Sale. prices are listed on individual pages in British Pounds. Please contact me to discuss purchases and methods of payment. If you use a different currency, you may wish to use the function on one of these sites.